My 70th year began for me last month. When I originally wrote this post in September, I stated that my seventieth decade had just begun. Prior to posting my second blog entry, our daughter was kind enough to let me know that that would make me 700, which I thought was both hilarious and a testament to the feebleness of my mathematical skills. As a writer, it sounded good to me, but I am not 700, although the idea of that sort of immortality does hold some appeal. I did turn 70 in September and the turn did come at 3 a.m., or so my birth certificate says. I, personally, don’t remember exactly. Wouldn’t it be odd if we could remember our births? It was, as I recall, a perfectly lovely day, spent mostly with my husband of twenty years. We had a slow start to the morning, but then now that I’ve retired, I get a slow start most mornings. I took phone calls from daughter Nicole and older sister Sue; had lunch at my favorite restaurant with a surprise treat from one of my best friends; picked out a gift of a beautiful birthday bracelet to commemorate the occasion of my 70th, and then went to a meeting. When I arrived home late from what proved to be an interesting conclave of citizens interested in the appointment of a new local school superintendent, I found a quite beautifully exotic flower arrangement from step-daughter Nicole, son-in-law Erik, and grandsons Simon and Toby. As it turns out, the arrangement had been created and delivered by a former student of whom I am quite fond ~ an added nice touch, although I wasn’t home to greet her. Don had baked me a birthday cake that, while being somewhat sartorially challenged, tasted delicious. 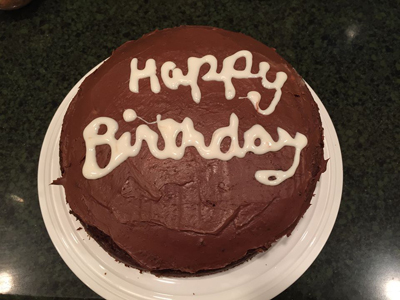 It was “dressed” in a rather ragged fashion as, much like madras, the icing used to spell out “Happy Birthday” had run, making it necessary if one read the message out loud to slur a bit. Along with the cake, of course, there was a card with a lovely message and an original drawing of the two of us. In the drawing, Don looks slender and svelte. I look as if my breasts had descended somewhere in the vicinity of my knees. Birthday Facetime with Nicole, Erik, Simon and Toby rounded out my day. I am a happy woman. Yet this birthday, as have many others, made me feel a bit nostalgic and a little sad. Birthdays always make me think of my parents, especially my mother. There have been birthdays in my adult life when I woke in the wee hours of my birthday morning to think about my mother giving birth to me. I would think twenty years ago today, thirty-four years ago today, forty-six years ago today, fifty years ago today, sixty-one years ago today, seventy years ago today my mother gave life to me and first held me in her arms. I am certain that one reason I have a penchant for doing this is that my mother never got the chance to see me grow up. I lost my mother when I was fifteen. She didn’t live to see me graduate from high school or go off to college, to watch me receive any of my degrees or begin to teach. My mother never knew I gravitated to theatre, a love of hers; never knew I won awards for my work. She wasn’t there to counsel me through the difficult times in my life, to tell me to straighten up or that I’d get through it or to say I had made her proud. She never saw me grow up, so I don’t know what she would have thought of how I turned out. Even now, as I can join my husband in saying “I’m 70,” and with this wonderful mate, terrific step-daughter, generously spirited son-in-law, two wonderful grandsons, a sincerely loving family of brothers and sisters and nieces and nephews and in-laws, supportive friends and former colleagues, devoted former students, and memories of a career I loved, I miss my mother. While I think of her often, I think of her most on the day I was born. I hope she would approve of me, of who I am, of how I turned out. I more than approved of her. Thanks to all who sent such lovely birthday wishes my way. I am 70 and I am a happy woman. I do believe she would have liked that.